Oh, the irony. 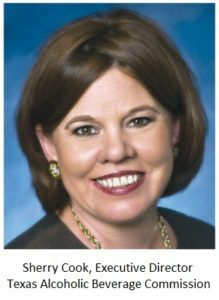 The executive director of the Texas Alcoholic Beverage Commission allowed illegal alcohol sales at a regional conference of state liquor cops in Austin, according to a retired TABC supervisor, and that could lead to criminal charges against the director and one of her cronies. The agency also paid its deputy executive director more than $12,000 per month to attend a police academy full-time at government expense, even though his job does not involve any law enforcement duties (more on that below). Darryl Darnell, a retired TABC supervisor who now works as a deputy constable, filed a complaint on November 7, 2016 against Executive Director Sherry Cook because the National Conference of State Liquor Administrators sold alcohol without a permit during its September conference. That might not be a big deal but for two things: (1) as chairwoman of NCSLA’s southern region, Ms. Cook presumably was in charge of the conference; and (2) Ms. Cook’s agency sends regular people to jail for selling alcohol without a permit. And then there’s what happened after Mr. Darnell filed his complaint. On Monday, TABC Captain Andy Pena called to speak with Williamson County Pct. 2 Constable Rick Coffman (Mr. Darnell’s current employer), but he was routed to Sgt. Leo Enriquez. I spoke with Sgt. Enriquez yesterday, and he told me that Captain Pena said he was calling as a “professional courtesy” to let Constable Coffman know that Mr. Darnell had filed a complaint against Ms. Cook, whom he identified as the TABC executive director. That phone call might be a felony. According to Texas Penal Code § 39.06(b), “[a] public servant commits an offense if with intent to obtain a benefit or with intent to harm or defraud another, he discloses or uses information for a nongovernmental purpose that: (1) he has access to by means of his office or employment; and (2) has not been made public.” Mr. Darnell filed his complaint against Ms. Cook solely as a private citizen, and he made no mention of the fact that he worked for the constable. So why did Captain Pena call the constable? Mr. Darnell has been a thorn in TABC’s side since his retirement last year. Several weeks ago, for example, he notified Senator Charles Schwertner, a member of the Senate Finance Committee, that TABC was planning to spend $60,000 for new badges that it did not need. On Saturday, Mr. Darnell forwarded to Ms. Cook an email that he received from an aide to Senator Schwertner indicating that the committee intended to investigate that expenditure. Now recall that Mr. Darnell filed his complaint against Ms. Cook on November 7, but Captain Pena did not call the constable’s office until three weeks later on November 28. Why the delay? I’m sure Ms. Cook was angry about the complaint, but I suspect the email from Schwertner’s staff over the weekend was the straw that broke the camel’s back, prompting Captain Pena to call the constable’s office on Monday. If the constable could pressure Mr. Darnell to find another hobby, that could solve a lot of headaches at TABC. Earlier today I sent a letter to the Texas Rangers and Travis County District Attorney Rosemary Lehmberg asking them to investigate both the illegal alcohol sales and the phone call from Captain Pena. Stay tuned. Readers of this blog may recall some of my prior dealings with Captain Pena, a.k.a. “Captain Cover-Up,” who is the director of TABC’s office of internal affairs. We first crossed paths when a client, State Trooper Billy Spears, filed a misconduct complaint against TABC Sergeant Marcus Stokke. Rather than investigate the sergeant, Captain Cover-Up called his former colleagues at the Texas Department of Public Safety and initiated an investigation of Trooper Spears. That ultimately led to a federal lawsuit after Trooper Spears was reprimanded for allowing himself to be photographed with Snoop Dogg at SXSW. In June, I started blogging about widespread misconduct at TABC, and I’ve since been deluged with new information about TABC corruption. Unfortunately, I don’t get paid to blog, and I haven’t had much opportunity to write about the new evidence, but let me share a few snippets that might interest the public. Multiple TABC sources have told me that senior administrators (including Ms. Cook) have obtained peace officer commissions even though the jobs of these administrators do not involve law enforcement duties. Why? Once they are classified as law enforcement officers, these pencil pushers get take-home cars and better retirement benefits. The car alone is a pretty nice perk, especially if you’re commuting from the suburbs into Austin every day, because you no longer have to pay for gas or the upkeep of your work car. Consider the case of Ed Swedberg, the deputy executive director of TABC and Ms. Cook’s top deputy. According to heavily-redacted records that I obtained throught the Texas Public Information Act, Mr. Swedberg was paid his full salary of more than $12,000 per month while he attended the University of Texas police academy full time between February and June of this year, plus TABC paid his full tuition and all related expenses. I defy anyone to find another government official in the State of Texas who was paid a six-figure salary to attend a police academy at government expense. Normally, TABC law enforcement agents already have graduated from a police academy (at their own expense or the expense of a previous employer) and obtained certification before they are hired. Some agencies hire civilians and pay their way through an academy, but many (like TABC) do not. Before I became a deputy sheriff in 1997, for example, and while I was attending the police academy at the University of Houston-Downtown, I delivered pizzas on evenings and weekends to help cover my own expenses. Thanks to the culture of cronyism and corruption at TABC, however, some employees get special privileges. Consider the case of Andrew Nicolas Pena, son of Captain Cover-Up and classmate of Mr. Swedberg at the UT police academy this year. The junior Mr. Pena was also a civilian employee of TABC, but like Mr. Swedberg, he was paid his full salary of more than $3,000 per month while he attended the academy at taxpayer expense. That smells like nepotism to me. As director of internal affairs, Captain Pena is responsible for insuring that TABC employees comply with the law and the ethical standards of the agency. And yet somehow his own son gets a sweetheart deal to attend the police academy on the government dime. That should tell you everything you need to know about the senior leadership of the TABC (and I have to wonder if Captain Cover-Up wasn’t trying to repay a favor to Ms. Cook when he made that phone call to the constable’s office). I have uploaded a full copy of the records that I obtained from TABC via my open records request. As I would expect, TABC buried the stuff about junior and Mr. Swedberg toward the end.